I know that my wish list may not be popular with all however please remember this is only my opinion. I would like to hear what others think. Considering that over 1000 permits have been sold this year I think that the Kelvin as a vulnerable recovering river needs every bit of help to make sure that it continues to recover. Consequently some guidance on managing fish stocks is advisable – advice was given many years ago when a study was carried out on the trout and salmon population. One of the main outcomes was that the river would fail to thrive if the killing of fish went unregulated. Signs to be put up at strategic parts of the river stating a permit is required. The river to be patrolled by a qualified bailiff and a number of informal wardens to assist. The Vet School to be made fly only and catch and release. Only five Salmon to be kept in any one season. Catch and Release of trout to be encouraged – trout over 12 inches to be returned. So far there are no signs at all along the whole course of the river – nothing to say a club is in existence which leads to widespread poaching of both salmon and trout. From what I gather you can fish the river for trout without a permit (at least that was what I was told by the old chairman) however it still makes sense to buy one. I have never seen a bailiff on the river, the people I speak to have never seen them either – that just isn’t right. The Vet School is enclosed and has some excellent fly water. Lets as an experiment make it fly only for a few seasons and see what happens – I guarantee you the trout will become enormous. From what I gather the Salmon chaps are having a bonanza – let’s limit those buggers fun. Only joking – what we have is an improving river if lots of salmon are killed then we are losing this years breeders and consequently the next few years run. Same goes with big trout – point to remember – if you kill a big trout you are killing the genes that got it big. I remember reading through the original report that examined the Kelvin around 15 years ago – it stated that undue angling pressure on the trout population would significantly affect future stocks. Am I being unreasonable? I would particulary like to hear from people in the States and people in England – how are your rivers managed? I’ve been fishing throught the park, Botantics and up to the Vet School but still learning the secrets of the Kelvin.. I work till half five so meeting after 6 sometime would be cool.. get in touch sometime through my girlfriends website.. reelbacking.com. Cheers & good luck, Neil. I was speaking to a neighboutr tonight and her hubby goes fishing and that includes the Kelvin .She was saying (1) that when entering via The Switchback security asks to see your Permit and (2) on one occasion he was joined in the water by a plod in waders who asked to see his permit …!!!! 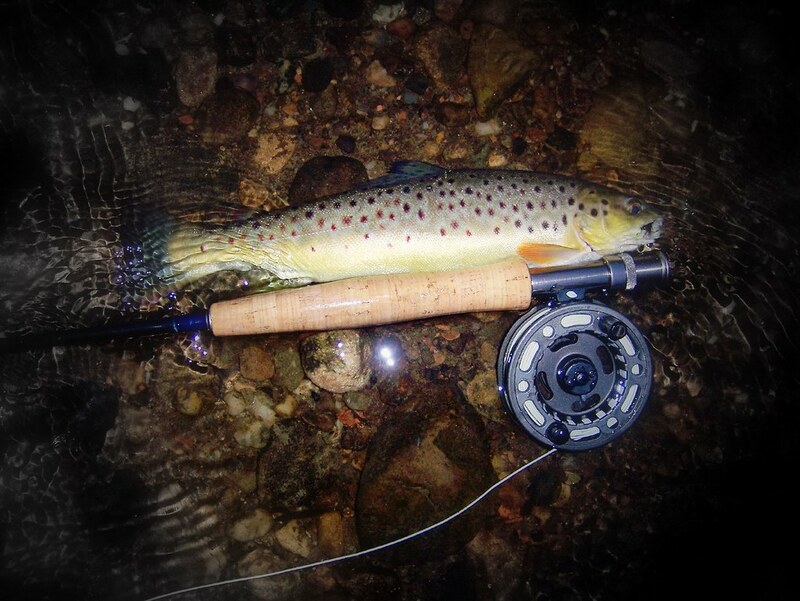 I’ve fished the same Slovenian rivers myself, great memories! The catch and release policy has been very successful; those rivers have some of the largest grayling I’ve ever seen! Have you fished the Unica? It’s a fantastic piece of water – more like a true chalk stream than a river, with a great head of grayling (they outnumber the trout by quite a way, not sure why?) I would highly recommend it. I fish some of the same stretches on the Kelvin as yourself – maybe we’ve already met on the river, who knows! Have a great trip in September, be sure to let us know how you get on! Robbie – I think you speak sense! Neil – thanks for the input, maybe we will meet up this season at some point. Stuart B – thanks for commenting, I hope you enjoy the river as much as we all do. Nikki – I wish everyone was as diligent with clearing up there mess as you are. Nicolas – fancy meeting up for a Pike session soon? Instead of poking at other peoples views what are your suggestions for improving the river? Essentially what the study found was that larger, older fish that should not be culled. Not only do the older fish provide “stability and capacitance” to the population, they provide more and better quality offspring. I am thinking back to what Charlie said about having a competition with his pal and his pal caught lots of large trout with the worm – if only everyone was as careful as Charlie and his friend as I know they were careful to look out for the take – most people I see fishing bait and basically just letting the worm or maggot just sit there. So if these people are catching large trout and killing them then it means it is doing harm to the fishery. I don’t think fishing catch and release plays into the anti’s hands as I do not think fishing will ever be banned. There are just too many people that enjoy fishing – it is a massive money maker all over the world. What you would need would be a world ban and that just is not going to happen. Maybe instead of a “fly only” section it should be any method as long as you use a fly rod and line – that way you can still trot worms and maggots and the fact you are in constant contact with the bait the deep hooking problems would be reduced. Sometimes when I speak to “old timers” they tell me how great the fishing was years ago (not just on the Kelvin) – they could catch dozens of fish every time they went and fill their family’s freezers up with the catch. They shake their heads sadly at how their favourite spot has deteriorated and blame water pollution or cormorants without realising that due to their own selfish fishing habits they themselves have destroyed the place they once loved. Alistair,-I think it’s a bit lax of you to say that fishing will never be banned-however,i still think the antis would have a more of a field day with compulsary catch and release rules-like i say,its more justifyable if you are going to eat the odd fish.You say you are willing to hear other suggestions for conservation and management of the river-ok-heres some that i have.1.A three tier ticket system-brown trout-local migratory fish rates-visitor migratory fish rates.The reason being that the salmon fishermen are actually getting the cream of the fishing-and i reckon we should pay most-but a local should pay less than a visitor-the way it is on most rivers throughout scotland.2.The extra money being used to create a hatchery for trout and salmon-the kelvin is one of the few rivers in scotland with no back up plan should these runs fail at any point-the 2oo3 drought highlighted this,as all the spring stock perished in the drought-that is why we never had any springers last year.3.An improved bailiff presence on the top stretches near spawning time,and into december-the numbers of gravid fish being killed is shocking,believe me,i release ALL my coloured salmon,and have made myself unpopular with some people,by also trying to get them to do the same-but i would not report them-i was always taught that if i had a problem,i should try to sort it myself.Contrary to alex-i am in favour of catch and release-i’m NOT in favour of compulsary catch and release on any stretch of the river-although if i see a significant drop in the numbers of salmon(or trout)in the river-my views on this would change accordingly-and please ask alex NOT to respond to my post-i just dont think he understands my points at all!cheers alistair. Oh-I almost forgot.4.REMOVE the current regime in charge of the kelvin-if you think the river is in danger now-it will be a WHOLE LOT worse if these seemingly useless individuals are allowed to continue doing next to nothing for the conservation of our cracking little river for the forseeable future -any plans for that?-anybody? Nice fush Nicolas . Can you tell us some about the catch .where …when….fly..etc etc ..
Good news!Just back from the kelvin and fished the vet school ,brilliant !what a lovely wee bridge and the water was smelling good !but not many fish rising ,just little 1 !but then after a 1000000 fly flew past !bingo !good rise ,miss !and an other take !crackr …….picture taken without lifting the fish off the water ,quick shot .made my evening !There are many hopes for our river,really fantastic ! and that was just before darkness !never give up till the fat lady sings!! the fly was a blackpennel with a fluo green tip ! !some streach of river should be fly only with no kill whatsoever !! So everyone can see my first ever decent kelvin fish!! Debbie & myself are hoping to be up there on Monday from about 4pm.. maybe see you there..
yes ,why not ,will definitly go back sometime soon .monday maybe ,so many things to do so little time for fishing !! Hi Charlie – I agree with all your improvements ….and so would Alex 🙂 4. might be a little hard though – I do think Dougie does a good job – pretty much the only one though. Charlie, the hatchery idea is the way ahead. I have fund raised for, and set up a hatchery on the River Ayr and am currently in discussions with the River Irvine board to act as a consultant for their hatchery. As far as migratory fish are concerned, a river is just a smolt factory, so the more we out in the more we get back. These are not my words but those of the late, great Hugh Falkus, and although somewhat brutal there is more that an echo of truth in what he said. Interestingly, Aurthur Olgilvesby said that until you’ve caught a thousand salmon you are in no position to talk as an authority about them !! Alistair, by the way, welcome back !!! How was me islan JA? !! The thing is alistair-ANY common sense suggestions for the river,would be very difficult to swallow by the current regime-and they will always have an excuse not to pay attention,by simply stating that salmon came back and are thriving WITHOUT them having to as much as lift a little finger to help them,i fear the only finger they WOULD lift,is thier middle one-to all of us. Alan-the meeting between us should be arranged asap-you have fund raised and help set up a hatchery WELL DONE ALAN-you are exactly the type of guy who should be up there helping with our own river,i had already realised you were one of the good guys out there-but my admiration of you has become far greater.A hatchery system benefits EVERYBODY who fishes the kelvin,even alistair and alex would have to agree,as it would also help to protect the gene pool of the big brownies.I’m sure the gathering of brood stock would be fairly easy,and there would be no shortage of people willing to help such an important cause.You have been there and done it Alan,so any input from you is greatly appreciated by me,and i’m sure i speak also on behalf of most of the “kelvinators”. All the very best-charlie. If you two get a hatchery for your bloody salmon I want an upstream dry fly only section (no emergers), a strict dress code and a butler. Not bad alistair-are you sure the cocktails were all you enjoyed-in da sun-our jamaican friends are famous for other”potent”products,was we “burnin”-ha ha only toking-charlie. in the search box and stand by to be amazed at how many returns it gives ….nearly 1400 to be almsot precise .. I’m busy plowing my way through them now . Was up at the Vet School this afternoon and to enjoy the “start” of the “summer” and to have a few casts too! Managed one wee one but I’m sure all the dogs swimming and splashing about in the water didn’t help much! One dog owner and her family repeatedly through a ball in for her dogs directly accross from where I, my girlfriend and another guy was fishing. Not all dog owners have the same lack of common courtesy though.. some did stroll past well behaved. Anyway, that’s my moan for the day! and what a lovely day it was too! Hopefully will be back up there during the week. Was anyone else out fishing today? Myself and “icatchkelvinsalmon”were out last night on the river to have a go for the sea trout-i blanked,but he had a spanker of 5lbs,at about 3am,and also a brown trout nudging the 2lb mark-while all i had was a couple of small pooks.the trout took what could only be decribed as a matuka-lazerlite,which he tied himself-this was from a good looking stretch that he and another of my mates had found late last year-the brownie was returned as usual ,but the sea trout was retained-it had long tailed sea lice,and it took him about 10 minutes to land-what a scrap he got,i took a photo of it,and will get my we boy to tranfer it to the p.c.-the fish are in! tight lines everybody-charlie. Charlie, what was the sea trout caught on? I would be very interested to know where it was caught but i wont press you for that info, unless you want to divulge!! By the way, whats your email addy – is it still the gmail account as I sent you a mail a while ago ? I would tell you guys-but i never found the spot, it was icatch,and he has sworn me to secrecy(for the moment),however-i dont think i would be revealing too much if i were to tell you it wasn’t too far from the luggie-as for the fly-he tied it himself-imagine a red ,silver and black matuka-with a blue lazerlight tied to the underside-dressed on a size 12 longshank double-honest it looks horrendous!but i was fishing a silver mylar bodied butcher-and i got none.Alistair,i’ll sort you out an addy asap-and you alan-i think the other one has expired. Any chance of letting us see the pic Charlie ? Hi folks. Have just started fishing in the Glasgow area and I know how to get to the Kelvin stretch in the college grounds (used to go picniccing with me gran) but how the hell do I acquire a permit? :S Thanks in advance for any sugegstions. Greg, Most ,if not all,of the tackle shops in the Glasgow area will have Kelvin permits for sale .Get hold of a Yellow Pages and give your nearest one a call to ask .Not knowing where you stay I can’t help by being more specific .They are ,if I recall correctly,£15 for the year . Cheers Stuart, I’m going to give loch Kilmardinny and the glorious canal a wee shot first but I’ll check the tackle shop in Yoker for a perimit. Hi Greg. I picked mine up at the Glsgow Angling Center for 15 pounds… unfortunately… it’s very hard to walk out of there with just your license! I’ve been struggling with access points in general but have been going in through the Vet School area… you sign in and out at guard shack. Take care. I think you can also access The Kelvin via The West Of Scotland Science Park from the roundabout in Maryhill Road just across the river from the Vet School . Lol, I know what you mean, you can never have enough gear. Am going for a wee trip down to Greenock over the weekend having heard of some good trout spots inland and 4lb cod from the pier. I don’t understand why people would poach in the Kelvin anyway, it’s 4p a day for a permit. Alright Andy,long time,no see-come doon the water,an we’ll have a chuckle-an please Andy-you know i’ll have had plenty by this time,i’m on fourteen now,biggest was a big kipper above the allander of 13lbs,even r is doing great-he’s had 10 to 10lbs(ha got the ten pounder from the tree pool)and they’ve all been fresh-many huv you got-or will i laugh the noo. Next week I will be putting up my new amended wish list – looking forward to all your input!